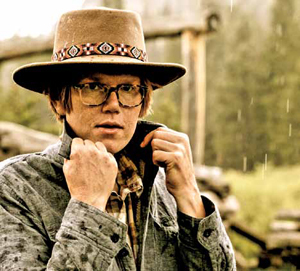 The singer-songwriter Brett Dennen (Kresge '04, community studies) stands out like a bright-yellow banana slug on a brown leaf. He's unmistakable, with his flame-colored hair, on-stage dance moves, and reedy voice. In the decade since graduating, he's traveled from the halls of Kresge College to Carnegie Hall, the Bonnaroo camping festival, and the Late Show with David Letterman. He's gotten the chance to hone his craft, traveling with musicians like Dave Matthews and Jason Mraz, but UC Santa Cruz left him with perhaps an even more important gift—something to write about. UCSC's community studies program left an indelible stamp on the lanky, six-foot-four, bespectacled Dennen, who looks younger than his 34 years. "I came from a sheltered environment, not a diverse town—a little cowboy town in the valley," Dennen said in a phone interview from Venice Beach, where he rested before playing a cruiseship festival from Miami to Grand Cayman featuring the band Train. Raised in Oakdale, California (Stanislaus County), he enjoyed being home-schooled but had a jarring experience in high school, which he calls a "failure factory" in a new song, "When We Were Young." UCSC was a much more nurturing environment. "Santa Cruz is where I first started making friends with people who were very different from me, and the first place where I studied social issues in school, because I had never really lived them," Dennen said. Dennen, now touring to support his album, Smoke and Mirrors, spoke of "mind-blowing classes" taught by community studies lecturer Mike Rotkin, and David Wellman, now a professor emeritus in the Social Sciences Division. Rotkin remembers Dennen as "a really good student who understands the importance of art and culture to get people to think critically. And he performed a song in one of my classes." UCSC's influence shows up in Dennen's best-known songs, including the haunting "Ain't No Reason," in which Dennen takes on apathy and social injustice: "Keep on building prisons, gonna fill them all. Keep on building bombs, gonna drop them all." At UCSC he also began to get more comfortable singing live and finding his voice. "I'm still pretty shy," he said, "but being up on stage forces me to let my colors out. I have a creative side that needs to be nurtured in a protective environment, and an extroverted side, that comes out in full force. People pay a lot of freaking money to go to shows. I want to be myself and have a good time. I just want the audience to have fun." Becoming a Slug was all but inevitable for Dennen, who divides his time between Los Angeles and Stanislaus County. His brother, sister, and three cousins all attended UCSC. Now he wonders what might have happened if he'd gone to a different school and studied in a different program. "Had I gone to an art school and just studied painting," said Dennen, "I don't know if I would have been able to really articulate the thoughts and feelings I was having about becoming a man and trying to make sense of my place in the world and all the injustice and beautiful and sad things happening all around."